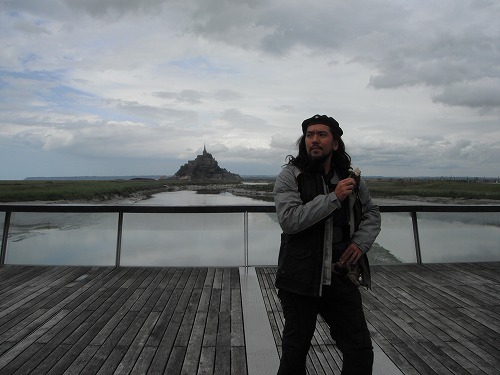 2012.07.01 なんと、モン・サン・ミシェル / Nantes and Mont Saint Michel! 2012.06.30 なんとナント!! 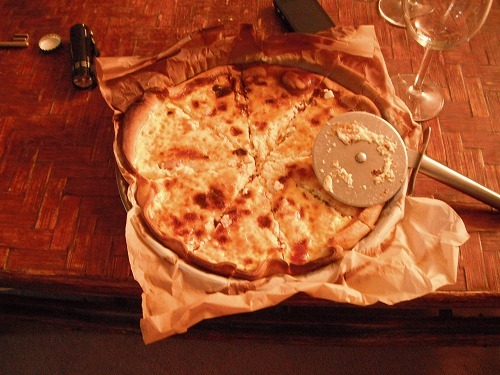 / Back to France, I am in Nantes. 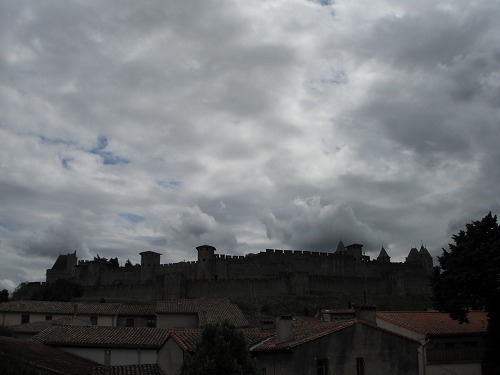 2012.06.12 カルカッソンヌ城、ずぶ濡れ、そして誕生日 / Carcassonne, Soaked in the rain and my birthday! I visited "Site Hillman". 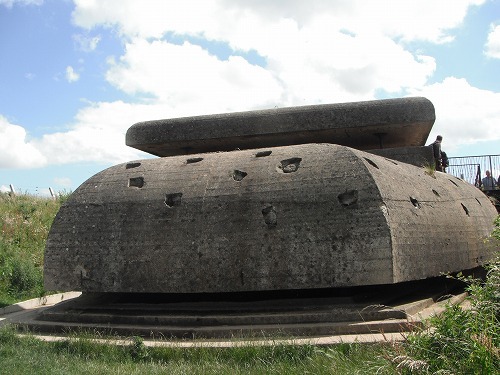 Here were a German bunkers and trenches against Allies. This part of Normandy was appointed British to attack. After bloody battles, British secured the place. 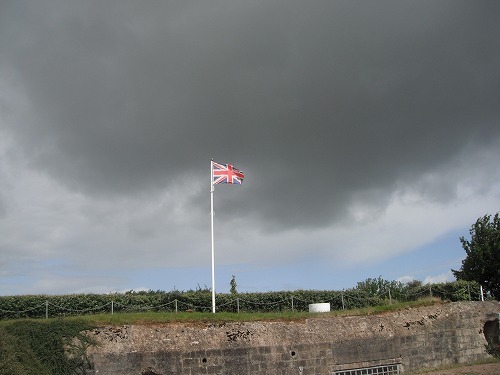 Union Jack was flying proudly. At a glance, it just looked like a nice country side. But there were concrete bunkers and trenches everywhere. 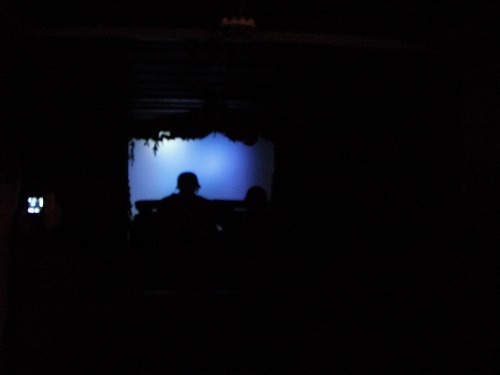 In the trench, it was dark and confined. In such a tranquility, it was hard to believe that there was a bloody battle 70 years ago and so many young lives were lost here. 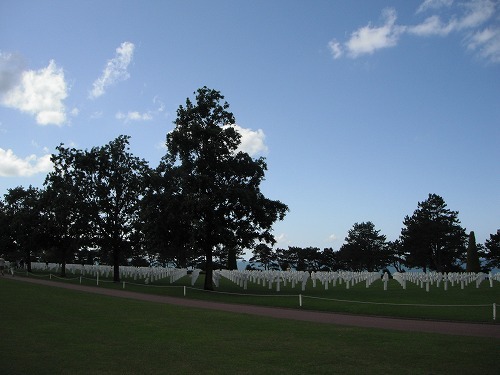 (The photo shown below is the view of the field from a trench). 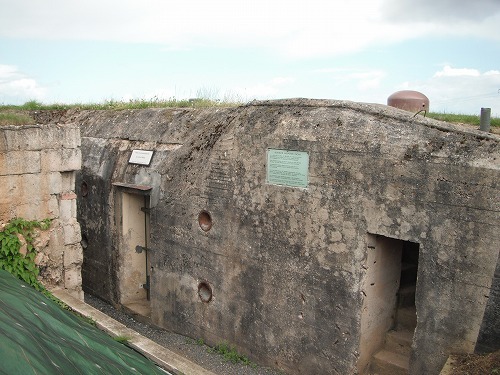 I visited Battery of Marville. On the way there, I passed famous "Pegasus Bridge" where Allies tried to capture to block German supplies and reinforcement to the coast. 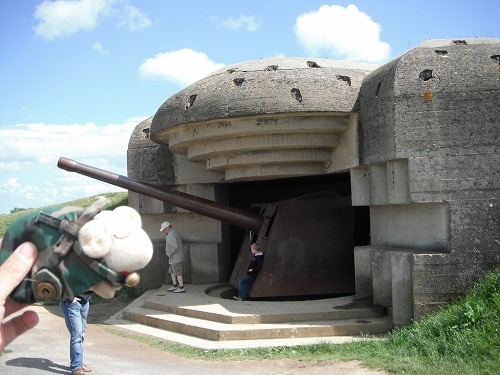 The site of Battery of Marville is now a museum and I had to pay 6 Euros to enter, so it was well maintained. Douglas C47 greeted me at the entrance. 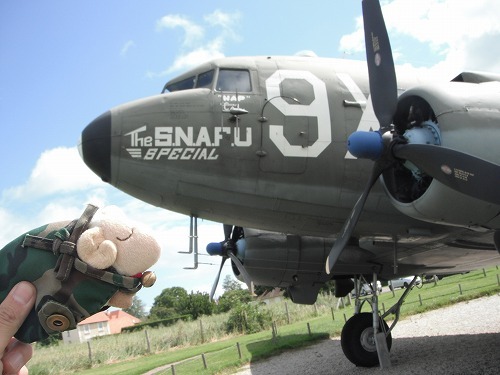 Those C47 transported those paratroopers from Britain to Normandy just before the landing. The paratroopers were dropped of the planes at the dawn of D Da. They supported those landing tropps from behind the enemy lines. M laptop battery was going to be flat soon, so I would write the rest later (now I am writing the rest at a MacDonald's). I was amazed with the thickness of the concrete walls of the bunkers built by Germans. Now we are living in peace. 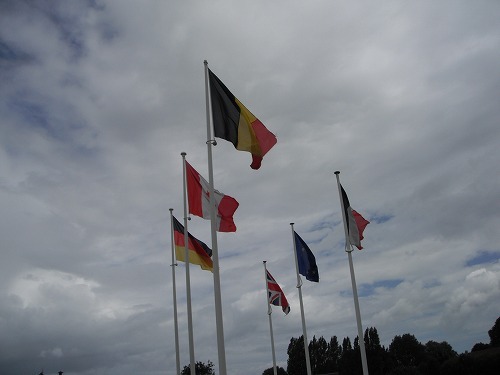 Those flags of Allies and the Axis are flying together. I headed to the west. It rained hard on the way and it got sunny again. 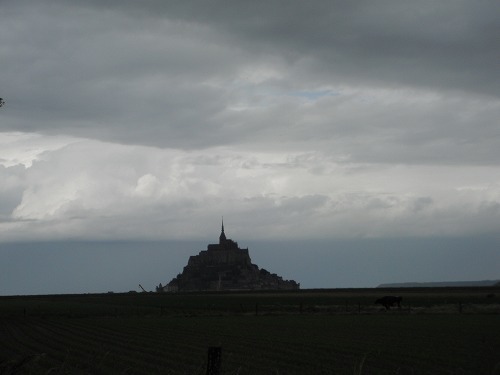 The weather of Normandy was changing every minute. The beach was very beautiful. 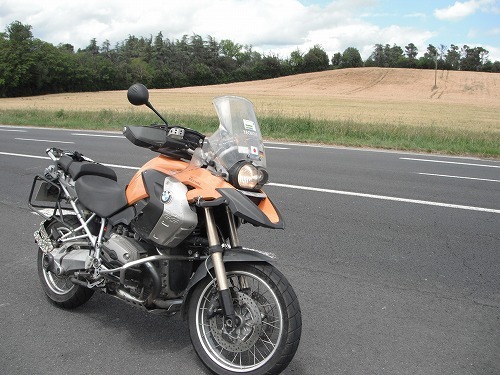 The fuel was low, so I started to look for a petrol station. But it was sunday. There were plenty of petrolstatons around, but they were all automated pump, only accepting credit card payment. Somehow mycredit cards did not work, so I needed to find one where I could pay in cash. But I could not find around there. So I went back to Caen and finally I found one! I wasted 2 hours like that. 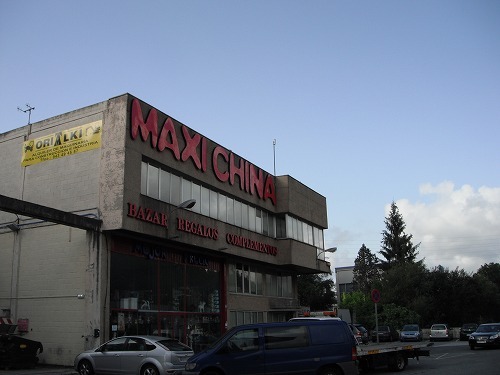 Also all supermarkets were closed and I could not buy any food cheaply. I ended up having lunch at a burger shop "Quick". 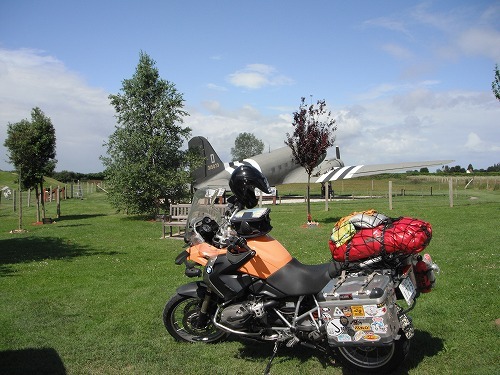 After refueling and lunch, I rode straight to Batery of Longues Sur Mer. There were those cannons used by Germans.They were really massive cannons. 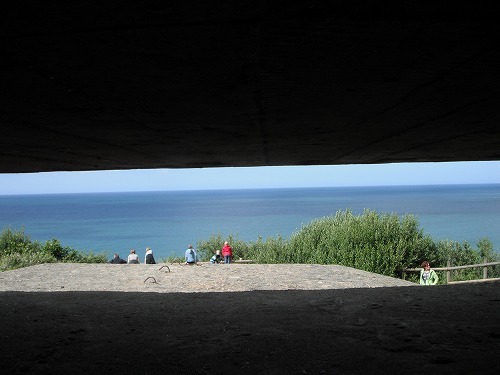 A view from a bunker. 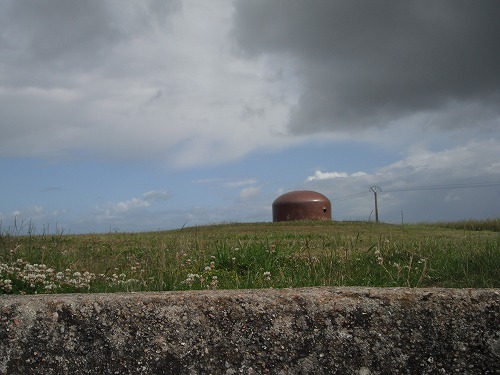 I reckoned here they spotted enemies and communicate the locations of enemy to the batteries to fire. 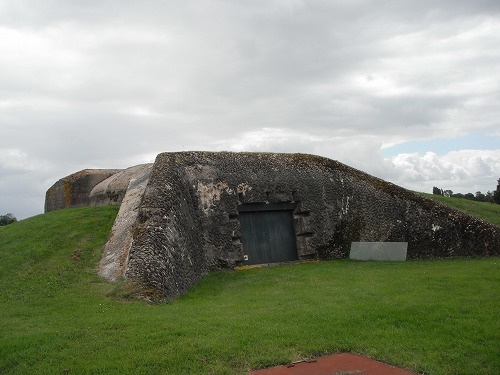 The view of the bunker from outside. There were scars from Allies atack. 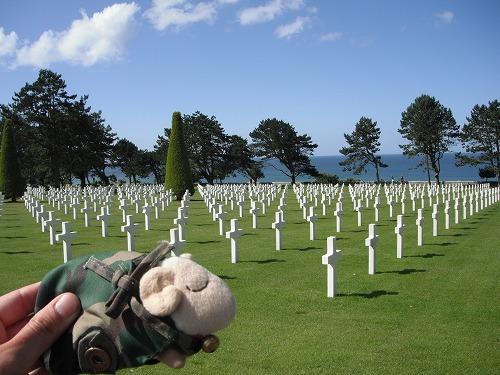 Then I visited Aerican cemetary at Colleville Sur Mer. 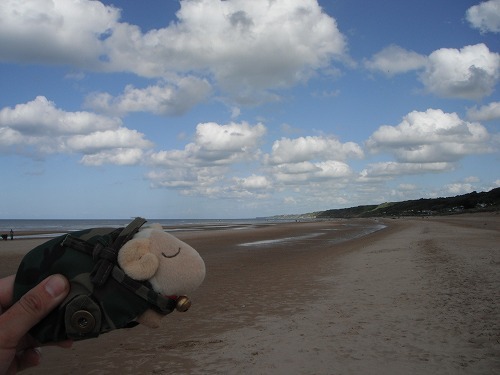 It's the heart of "Omaha Beach" where American troops landed. 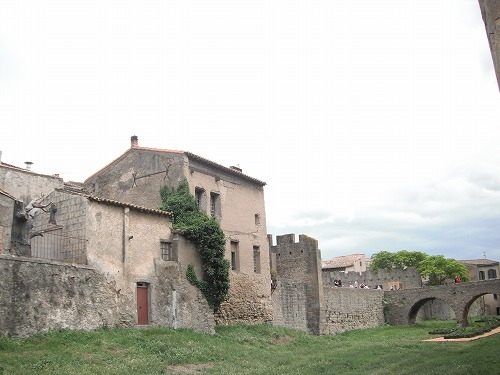 The famous first 20mins battle scean from "Saving Private Ryan" took place here. It was hard to believe that the beach and the sea turned into red with soldiers blood. When I saw so many tombs of soldiers, tears came out frommy eyes. So many of youg lives were lost in the battles. With Mr. Sheep, I had a minute of silence there. I went down t Ohama Beach. Now it is a beautiful beach, but on 6th of June, 1944, it was bloody and deadly place. It was after 6pm alrady. 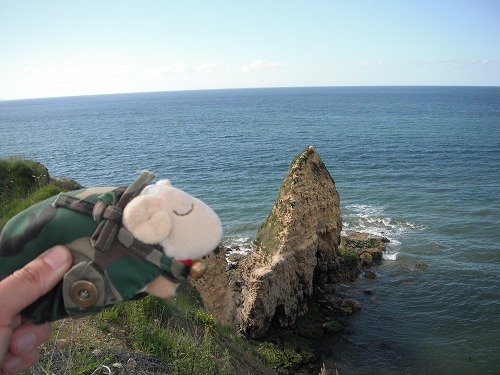 I visited Ponte Du Hoc. 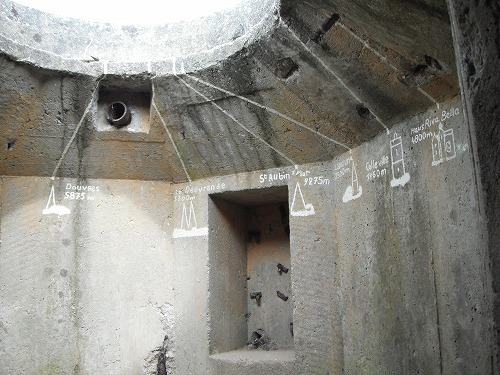 Here the German Battery was built on the top of a teep cliff. 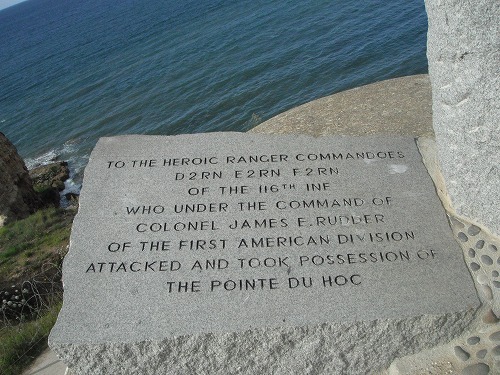 The US rangers climbed up the cliff with their ratlines. So many of the rangers lost their lves, but in the end they could secure the battery succcessfully, which saved lots of lives of the landing troops. They climbed up the cliff like this! 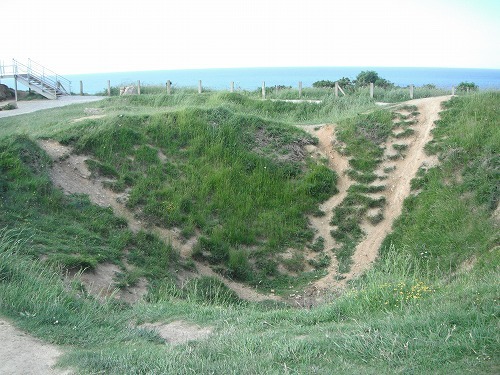 There were craters by Allies' bomberdments. 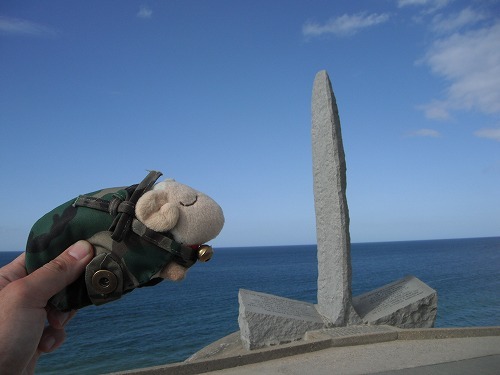 A monument was standing at the edge of the cape. 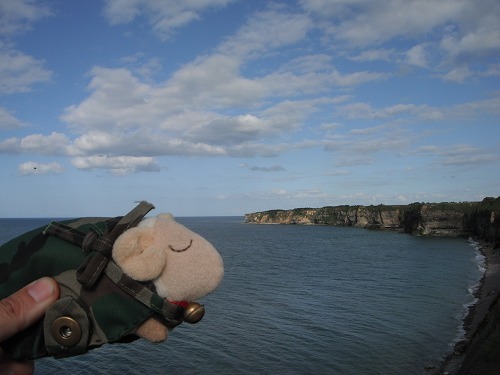 The eather was not really god in Normandy but I really had great time there. 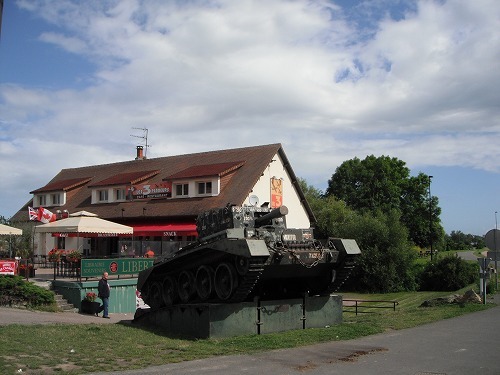 Besides "D Day", Normandy has got wonderul landscapes, nice towns and nice atmosphere. I wanted to visit "Grandcamp Maisy", but it was already after 7pm and the site was closed. I went to a campground close to the ferry terminal. 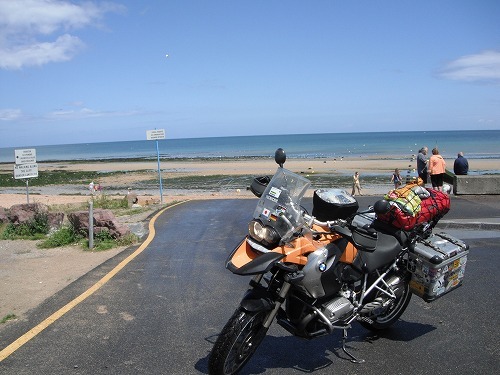 Tomorrow I will cross English Channel to Great Britain! I have to be careful as I will ride on the left hand side! 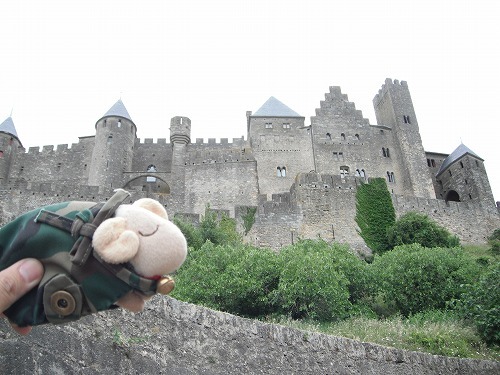 なんと、モン・サン・ミシェル / Nantes and Mont Saint Michel! It started rainng while I was packing... I was just about putting away the tent, but so I escapedinto the tent. I waited for a while stop raining. Luckily the rain stopped in 20 mins, so I restarted packing up I wiped the tent and let it dried. It took a while but I could leave by 10:30am. But I found out the headlght bulb of Esperanza was out. I had to buy a new one somewhere. 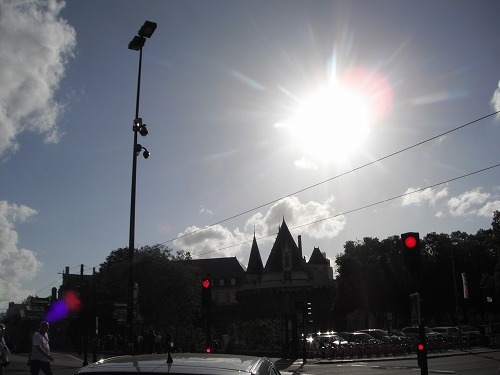 I went to the centre of Nantes. Cathedral was pretty impressive. 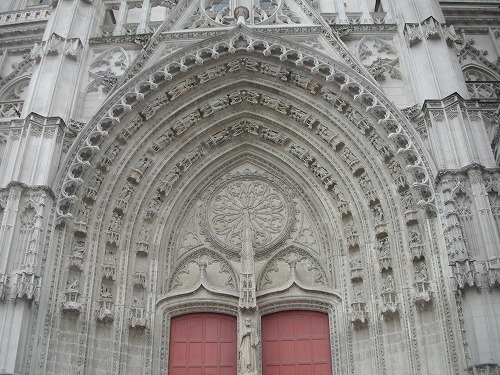 Those curvings above the main gate were really detailed. 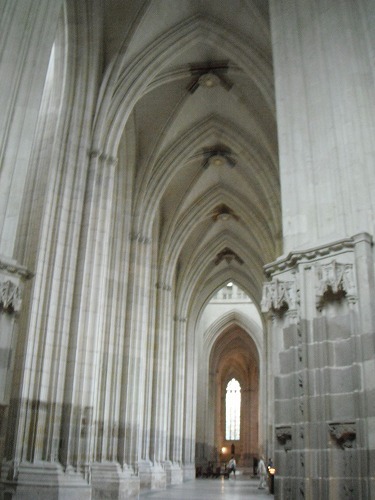 The inside of Cathedral was plain and simple. It was solemn and I liked that. 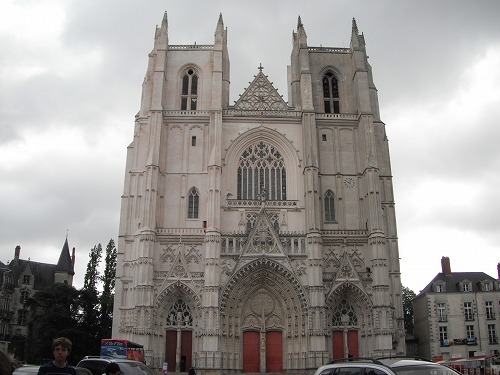 I've seen many churches and cathedrals, butI like this Cathedral of Nantes. It could be the on of the best so far. 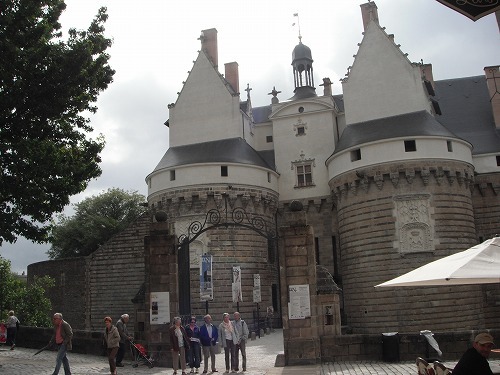 I visited Castle of Count of Burgundy. 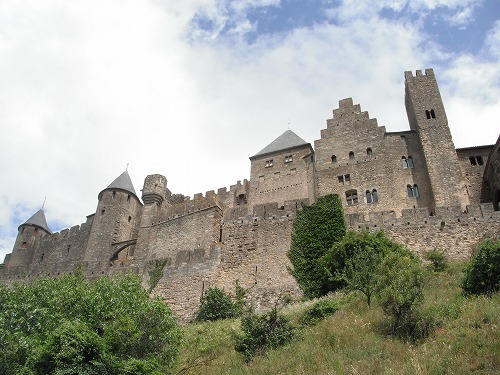 There was a moat surrounding the castle, and the difense seemed to be pretty tight. But inside of the castle was not really huge. The house looked elegant. It started to rain hard again. 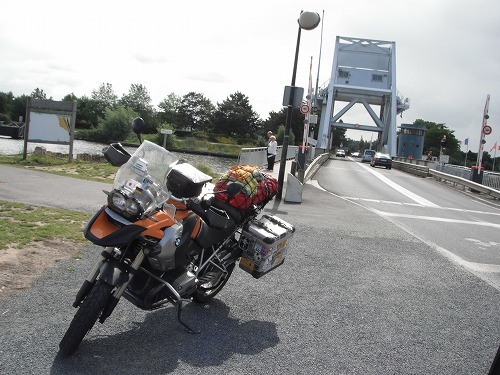 I gave up sightseeing Nantes and escaped to a petrolstation. Here I could buy a lght bulb and fitted it. I waited there until the rain eased up. It rained and stopped. 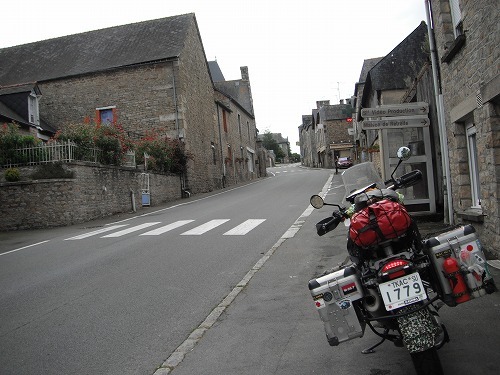 Those little towns and villages on the way were built with stones and were really nice. If the weather was better, they would be prettier. 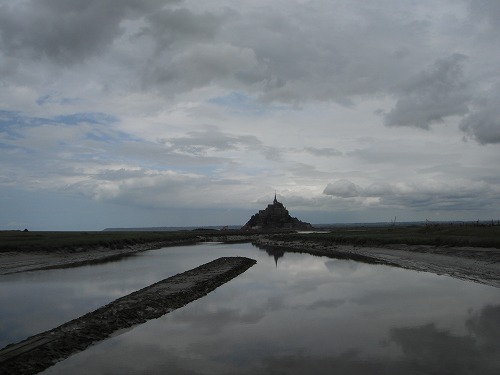 Then, finally I saw Mont Saint Michel in a distace!! I pulled over at the roaside and tok a photo. I thought I could ride up to Mont Saint Michel really close up, but all vehicles were to be parked at a paied parking area.... I saw a number of British registered motorcycles went past. I thought they might know a tricl, so I followed them. But it srated to rain rally really hard. There was a food stand and had a few tents where we could stay dry, so we had a cuppa and had a chat. 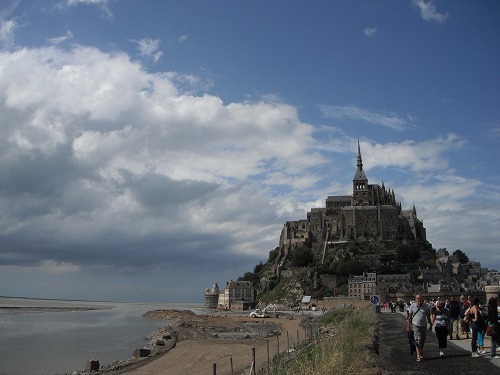 As they were gong to tae a ferry this afteroon, so they would not go into Mont Saint Michel, they said. 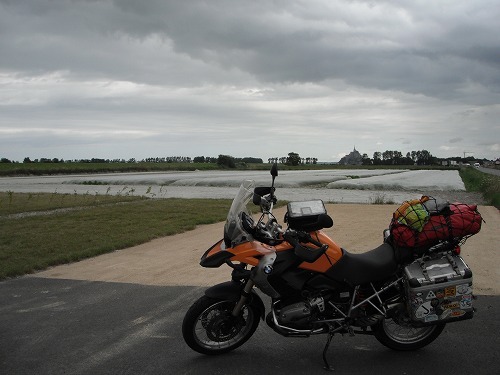 The rain stopped and I said good-bye to those Bristish riders and went to the parking area. It cost 3.5 Euros for 2 hours... It was not as expensive as I thoughtbut it was stil expensive. 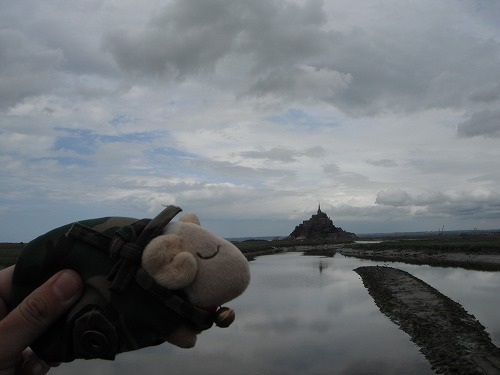 Mr.Seep was very disappointed with the view of Mont Saint Michel with the grey sky. 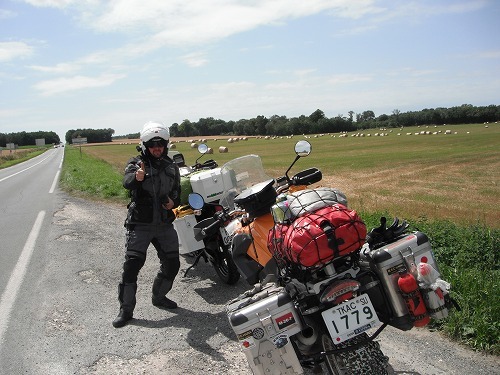 I met 3 Japanese girls on a short holiday in France there. 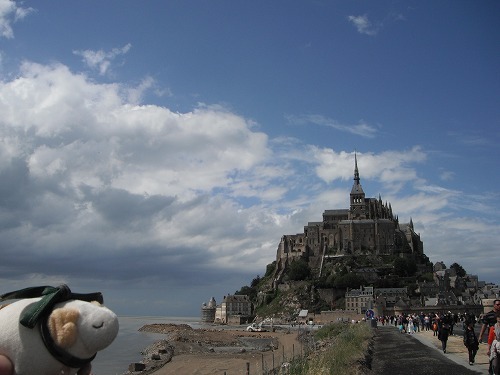 I asked them to rake photos of me and M. Sheep with Mont Saint Michel. While I was talkng to them, the weather got beter!! Now Mr. Sheep was happy!! 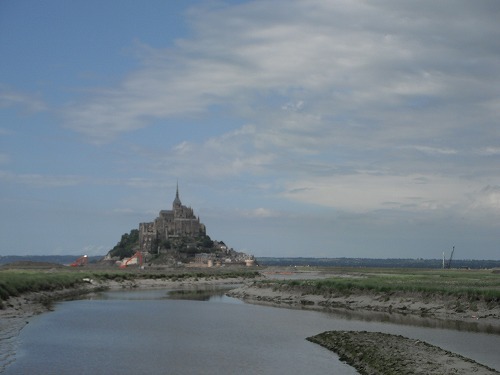 A shot of Mont Saint Michel with a zoom. 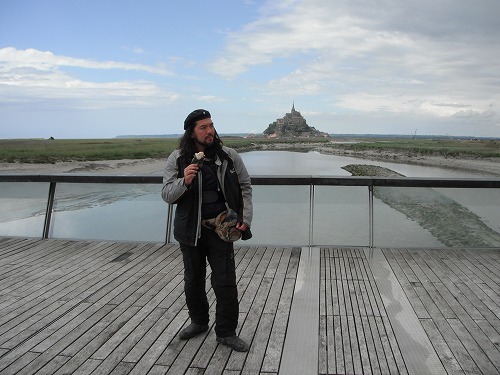 I said good-bye to them and took a free shuttle bus to Mont Saint Michel. Sankaku with Mont Saint Michel. But I did not go inside. Those Japanese girls told me, I could go inside the gate and around for free. But to enter Monastery, I had to pay a fee. I imagined inside would not be very special and I wanted to go ahead while the eather was good, so I turned back to the parkig area. I rode to Caen and it took 2 hours or so. It eained hard a few times on the way. I arrived a campground after 6pm. While I was pitching the tent, it started to rain again. When the tent was done, it was pouring and it continued raining hard for 30 mins or so. 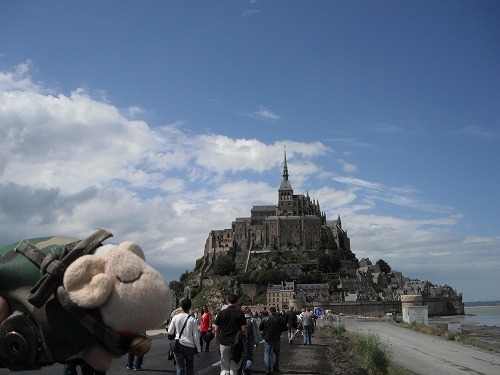 Luckily I did not spend longet in Mont Saint Michel. 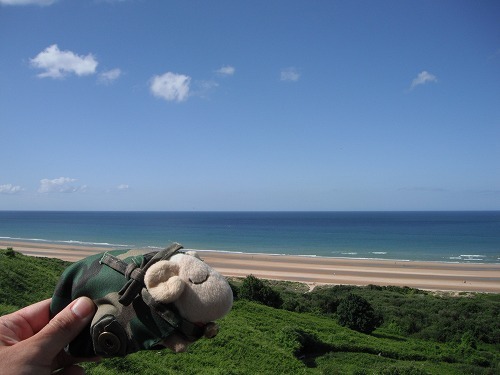 So I am in Normandy. The place where D Day invasion took place on 6 of June, 1944. I watched those D Day movies and TV series like "The Longest Day", "Saving Private Ryan" and "Bond of Brothers". I asked info at the campground and I am ready for tomorrow! なんとナント!! / Back to France, I am in Nantes. It was overcasted this morning. 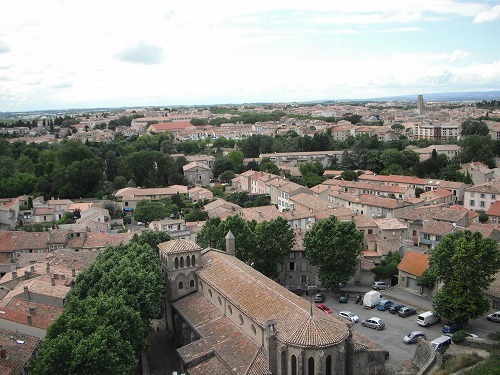 Daniel would be heading to Angers and would stay at his friend'S place. 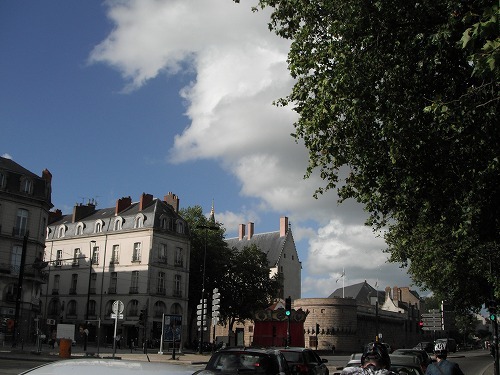 I would be heading to Nantes and spend a night there and heading to Normandy. So we rode together today until the junction we split. 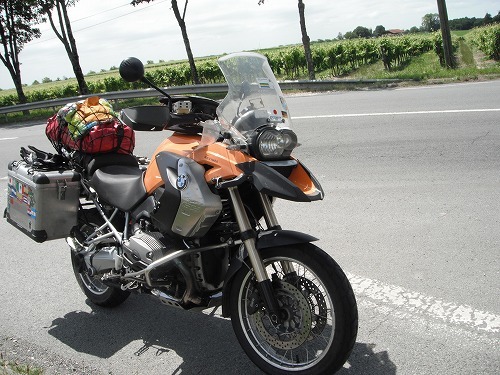 In France, we were riding to Bordeaux first. But there were many small towns on the ways and tons of roundabouts. So we could not ride the distance. We made just 80km after 2 hours. We pulled over at the road side and discussed if we could another way to avoid roundabouts. We could take the toll way, but we would not want to spend extra, so we decided to stay on the same way. Then soon, it became a major highway and we could cruise at 90-100km/h. 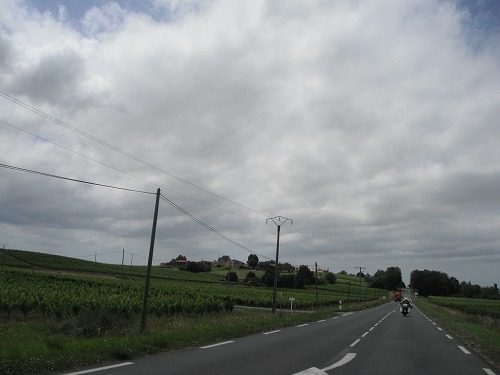 We bypassed Bordeaux and then there were many grape vines everywhere. 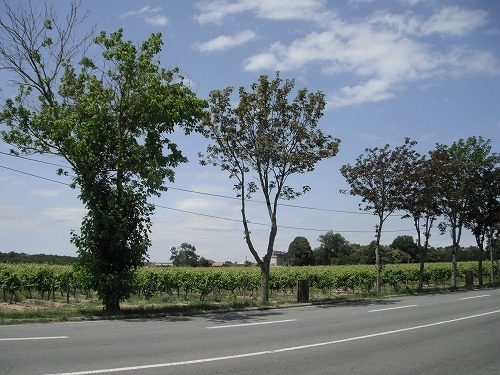 Yes, Bordeaux is one of the most famous wine production area in France. If I could drink wines I would visit some wineries, but I cannot have any alchole. Daniel also wanted to go ahead as we just made less than 200km so far. We had a long ride ahead of us still. We passed a small town named "Champagne". I was not sure if it was the "Champagne" - the home of sparkling wine "Champagne". 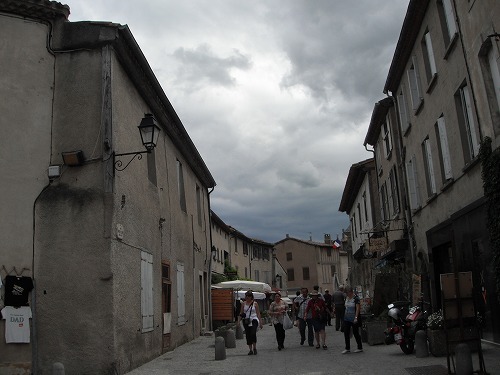 As we rode through the town, we did not take any photo. そしてダニエルとお別れのときが。約一週間一緒に行動しましたので名残惜しいですが、彼もワシももともと一人旅。Buen viaje mi amigo! Suerte!! Then we came to the junction where we split. We rode together for a week. It was sad to be apart. But we are primary travelling solo anyway. Buen viaje mi amigo. Que te vaya bien y suerte! I was riding straight to Nantes. I arrived Nantes after 7pm. It was still bright and I could see the city well while riding through. There were rivers, cannels and beautiful buildings. I would like to spend a few days here (but I have to move on...). It's pitty that I will be leaving here tomorrow. I will walk around the city tomorrow morning before heading to Normandy. The campground I went was 5 star campground. I thought it would be 20 Euros but it was 25 Euros as it was already high season!! 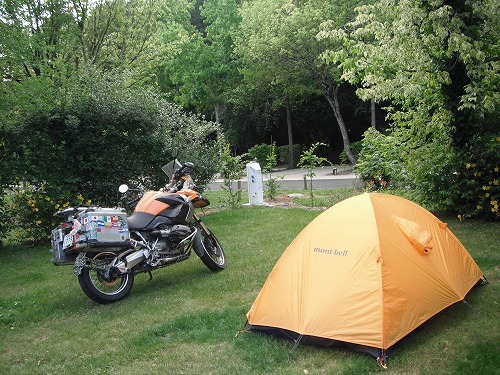 I thought about going to another campground, but after 600km of riding, I decided to stay there. 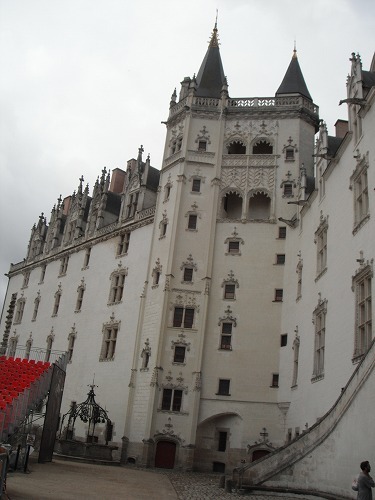 I will explore the city of Nantes, I will visit Le Mont Saint Michel, and then I will head to Caen in Normandy. It's Ernesto Rafael Guevara de la Serna's birthday. 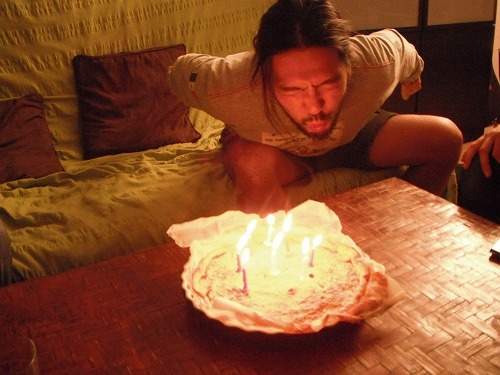 Happy Birthday, Comandante. It was a sunny day. I washed my clothes and went out to Picasso museum. 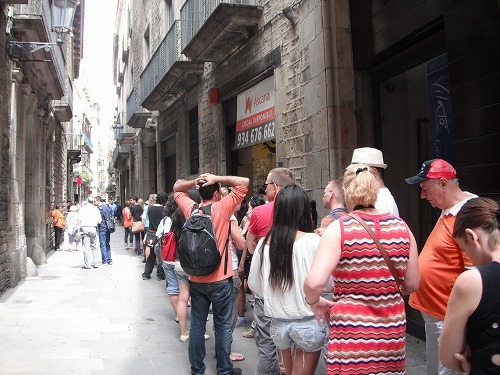 It seemed to be a popular tourist destination, so here was a long queue. But luckily 2 guys in front of my were Japanese - Kaoru and Hide, so I was chatting with them while waiting. So I did not feel like waiting that long and we could get into the museum. In this museum, there were paintings from his youth and paitings from the later period of his life. Those paintings from his youth, they were not like "Picasso" which I knew. Unfortunately taking photo was prohibited. Among those paintings from his youth, there were some with humour. And then his style was becoming to be like "Picasso". I had seen some of paintings of Picasso before, but it was the first time to see so many of his paintings at once. There were many interesting pieces. But some looked like as he did not put much effort. 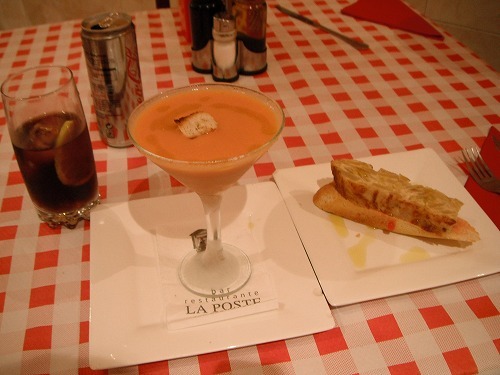 I had a bocadillo and a drink for lunch with Kaoru and Hide. Then they took a touristic bus to a football stadium. Have a good trip! 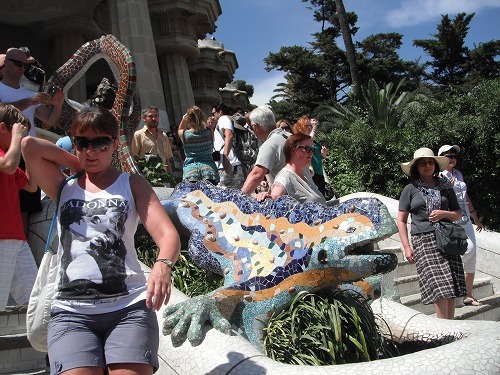 I took a metro to Parc Guell again. 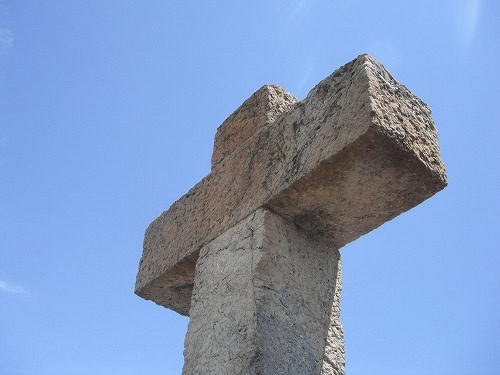 I climeb up to Tres Cruz on the highest hill in th epark. 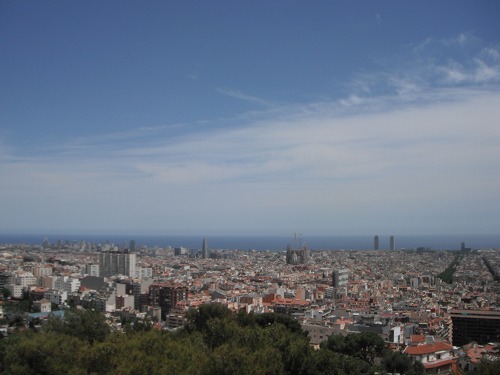 There I could see the city of Barcelona clearly. Then I went down to the plaza. One street performer (?) liked my "Che" style and he asked me to take a photo together. Some how he was in Chinese style outfit. The broken tiles were used for ceiling as well. 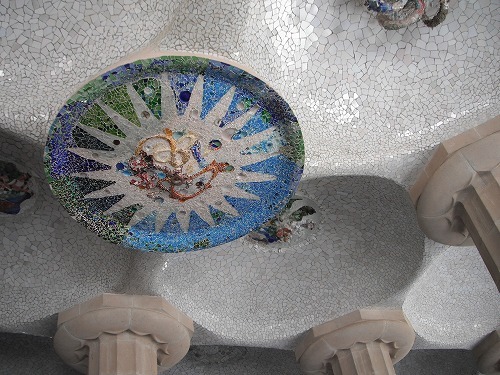 As Gaudi used curves a lot, the tiles needed to be broken to cover the curved surfaces. THe view of the park from the main gate. 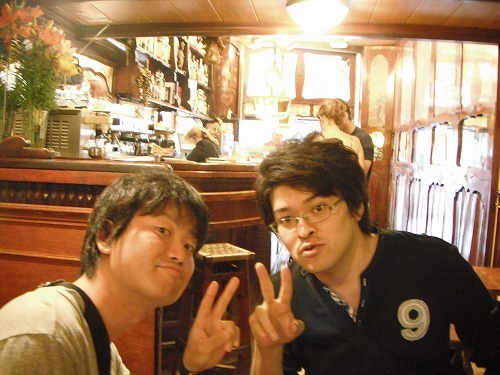 In the evening, I went out to have typical SPanish dinner with Mr. Yata. I wondered what would be served. We caught metro to downtown. 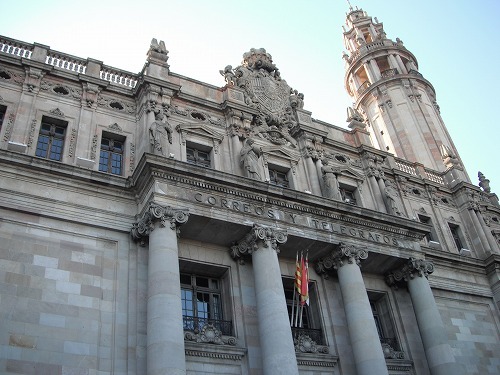 This is Central Post Office. We went to a restaurant where Mr. Yata had been eating at for 20 years. But just a month ago, the owner of the restaurant had changed. 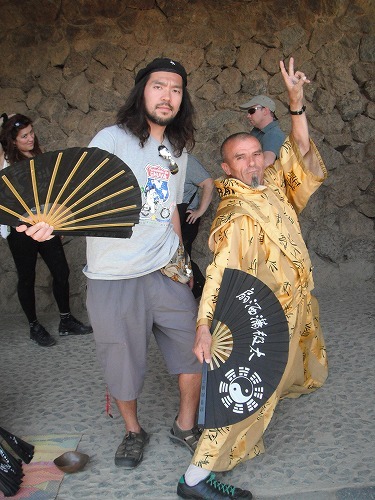 As Mr. Yata was in Japan for a while recently, he did not know and was shocked. 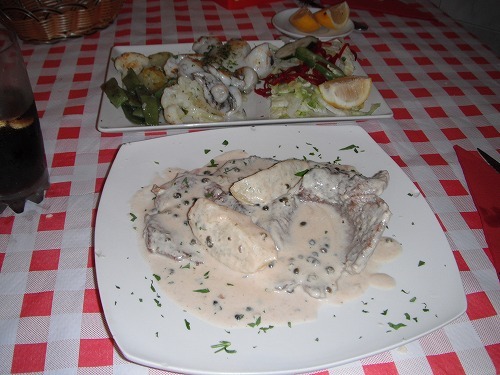 However, the quality of foods served was not lowered, and for just 11 Euros, I could have this much!! 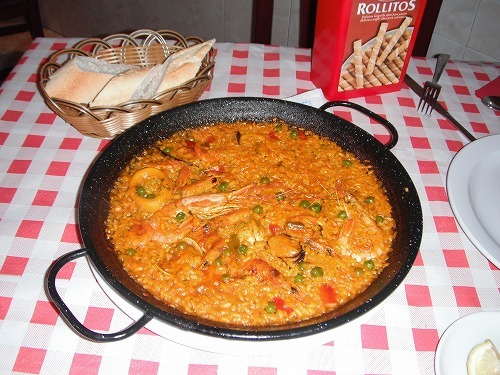 An entree, Paella (the photo show was for 2 people), and the main dish (beef in cream sauce). It came with a desert too! Then we went to Spainish Plaza to watch the fountain show. 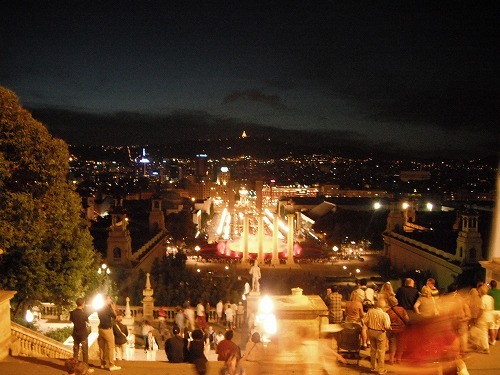 It was amazing and the night view of the city was beautiful. 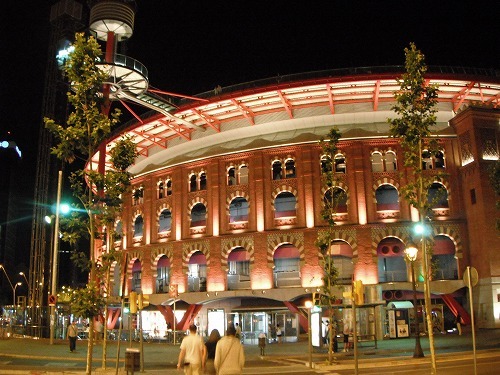 A shopping centre near by the plaza used to be a bull fighting stadium. The basement of the stadium was lifted for 5m or so! Amazing!! Thanks for a great evening, Mr. Yata. 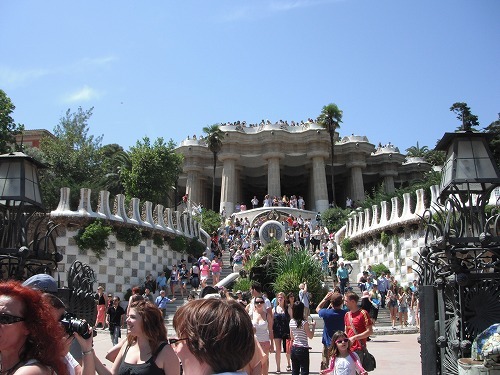 I will leave Barcelona tomorrow to Valencia. 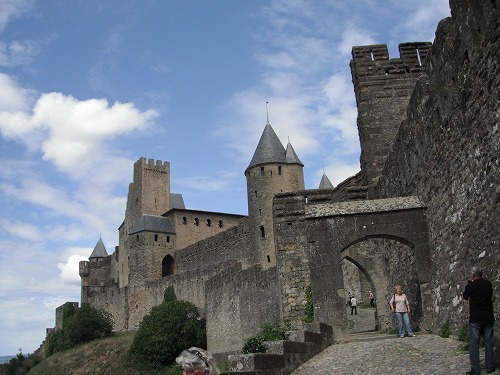 カルカッソンヌ城、ずぶ濡れ、そして誕生日 / Carcassonne, Soaked in the rain and my birthday!